You must make reservations at least 5 minutes in advance of the time at The VÜE Rooftop Bar & Lounge. 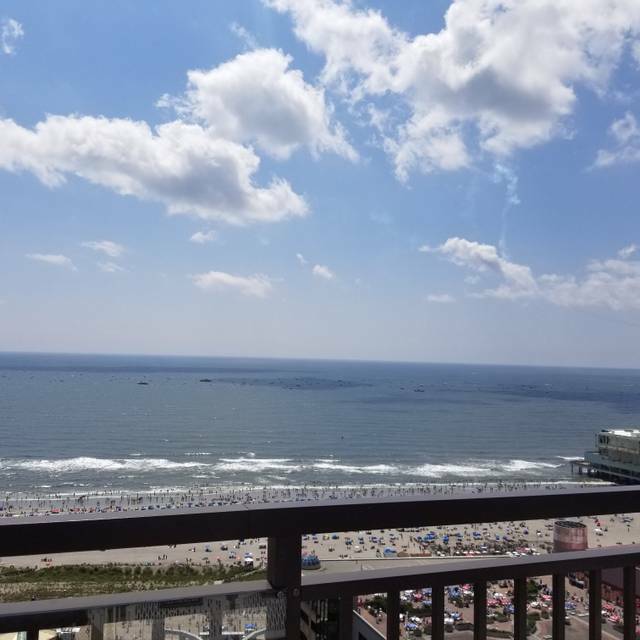 The VÜE Rooftop Bar & Lounge, located on the 23rd floor of The Claridge Hotel is known as Atlantic City’s exclusive rooftop bar with an unforgettable panoramic view of the city skyline and ocean. The lounge offers a cosmopolitan menu made up of local favorites with fresh ingredients. The contemporary design allows for guests to sit back and enjoy the historical city with indoor and outdoor unforgettable views throughout. The Claridge Hotel, nicknamed in 1929 as “Skyscraper by the Sea” boasts a Boardwalk Empire era style décor, portrayed in all 483 renovated guest rooms. We were staying on the 7th floor and had a hell of a time getting up to the Vue! The elevators only go to the 21st floor. There is one that does go to the 23rd but we couldn’t get it. There should be a sign saying go to the 21st floor and take the stairs to the 23rd. That’s what we did but took us 15 minutes from our room to there. We spent time waiting for elevators that never came, etc. This wouldn’t have been a problem except it took another 10 minutes to get menus after being seated, another 10 minutes for someone to take our order, and then about 30 minutes later we were still waiting for our food. We wanted to leave there at 7:15 for an 8:00 show. The food was delicious, yet we didn’t have the time to finish so we took it with us. Maybe they were short of staff that night. Staff was warm and welcoming. Ambiance was spectacular and the food was delicious. Have already told friends and family about The VUE. I have highly recommended it to everyone. First off, there should be mention of only 2 of the elevators from the main lobby being able to take you to the restaurant. I asked someone that worked there and she gave me the wrong floor. Outside of the view, I would not recommend this place. There are only a few tables, maybe due to the time of year, and it's pretty much self seating. I made a reservation and listed it was for a birthday, which was a waste of time because that was not recognized in anyway. The service was not great and the menu options were limited, so a dessert wasn't even an option. The food was just ok. If you want a nice view and drinks and have no other options this was be a choice, but I would suggest venturing to another location if you want quality service and a meal. My husband and i set reservations but unfortunately we didnt make it on time. However later on that evening we went an it was simply the best view. We order hot wings which could have been a little more well done but they were tasty the drinks were Great the atmosphere was wonderful. The DJ played up to date music. My Husband an I will be back. Thanks Claridge. We actually went to the VUE twice during our short stay at the Claridge. Bartenders were a bright spot. Very friendly and quick to answer any question that came up. We ate a late supper Saturday evening at the VUE, roof top bar consisting of Appetizers & drinks...staff were very accommodating, friendly & eager to please. The views of the sunset were outstanding. Food presentation was appealing, temperature of our selections were spot on & food taste & quality was very good. Sunday we attended the Brunch, again on the roof top. Available were an omelette station, various bagels, muffins, croissants, breads, scrambled eggs with bacon/sausage, French toast, hash brown potatoes, fresh fruits, chicken, salmon, asparagus & several other items. The fruit selections consisted of sliced pineapple, strawberries, honey dew, cantaloupe & grapes. The sliced pineapple & strawberries were so sweet & tender (which totally shocked me) as out of season or fruit not locally grown can sometimes be hard & tasteless. Not the case here, so kudos to the chef on every aspect involved in meal preparation from knowing which vendors offer quality food items to buy from, to preparing & presenting the meals. A great experience & I will definitely be returning. Thank you for the wonderful experience!! Absolutely disappointed, I’m still not sure if I ever got checked in for open table. The rooftop area has absolutely amazing views, but the service and food were terrible. The fire pit stopped working shortly after sitting down. This place has a lot of potential, but it has a long way to go. Not impressed with anything other than the view and I can go someplace else for the view with much better service! We had such a great time we stayed until they actually closed... The server was amazing and the food was delicious. We were here for the air show preview day. Your server, Anil, did a fabulous job with the unexpected crowd that showed up. Had a reservation. Was the 2nd group there. Gave drink order. No drinks. Finally went in and got our drinks at the bar. Was the last ones to get food. 3 meals were wrong. The staff kept saying they were not expecting this many people. It was the AC Airshow practice day. It was not full at all-maybe half full on one side. There was no one on the left side. As I said we had a reservation as I am sure others did. Seemed under staffed. No one checked us in. We just walked outside and then a girl followed us with menus saying we can sit anywhere and she would come over to us. Seemed like only one server for the entire outside area which caused service to be slow. Girl seemed new because she didnt know how to answer questions like draft offerings for happy hour. Table was dirty took awhile for her to come back and clean it. Happy hour was a good value. Fat tire drafts were refreshing and chicken wings were delicious that we ordered another ordee. Nice view. Nicest thing about the claridge. Great “Vue” from the rooftop. Food was hot and tasty. Waitress very attentive. you need more domestic beers on tap for happy hours you only have one choice. the bar tender need more help took a long time for are wings to come out. the view is real nice but it was real windy the day we were there so could not realy enjoy it. The best rooftop view of the Atlantic City skyline.Great for drinks, very romantic setting. Would not go for the food! Excellent staff, food,environment and ambiance. Great view and atmosphere. Excellent view, and decently priced drinks. They have finger food, but nothing that will wow you. Great place to kick off the night, as long as its not too windy. This is a fun place with a wide cast of characters - interesting open mic performances! They do not serve dinner or accept reservations so this was very misleading. Nice rooftop area to have a drink. The food was good, service was excellent. It is very small inside. We made reservations for a table for 8 and a table for 6. When we arrived they did not have reservations because they DO NOT do reservations. I showed them our confirmations, etc and they had no idea how this could be since they do not accept nor do they make reservations. That was a little upsetting and we all squeezed into 2 little round tables that would seat 3 with 13 of us. Other than that, the DJ was good. Would suggest that they take down their reservation tab since we were not the only group it happened to that night. Not worth the elevator ride to the 23rd floor. What should have been a pleasant evening was clouded by a complete lack of anything remotely resembling an efficient operation. We were greeted by a staff member disputing the fact that they took reservations despite making one on Open Table. We were escorted to the outside seating area. Tables were sparse - almost an afterthought. The drinks we ordered were brought to us in plastic cups - not even sized for the type of drinks. We had to ask for napkins. Service was slow. The server apologized saying the kitchen was backed up despite the place being almost empty. Disregard the dress suggestion of "business casual". Shorts and tee shirts were in abundance. Hopefully they will improve. The view was the only thing positive to comment on.